"This has a pinch of chile pepper as the secret ingredient. It's firm yet unbelievably light and airy. The little bit of chile pepper is in there just to bring out the flavor of the chocolate and add a tiny bit of delicious heat. 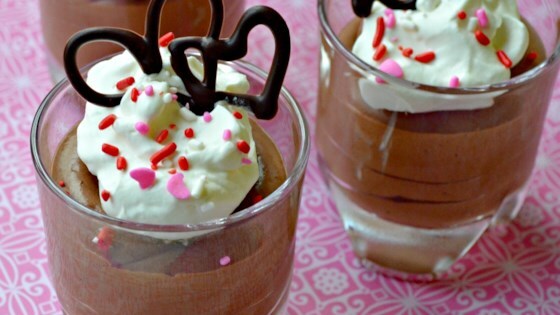 Garnish each serving with a dollop of whipped cream and a sprinkle of shaved chocolate." Bring a saucepan of water to a simmer over low heat. Place chocolate, butter, 2 tablespoons water, ground chipotle pepper, and salt in a heatproof bowl; set bowl over the simmering water. When the butter melts, whisk the chocolate mixture gently until smooth and shiny. Set aside to cool for a few minutes. Whisk egg yolks, 2 tablespoons water, and sugar in another heatproof bowl over the same pan of simmering water until egg yolk mixture is foamy and hot to the touch, about 3 minutes. Pour hot egg mixture into warm chocolate mixture, whisk until smooth, and set over a bowl of ice to chill. Whisk constantly until mixture has cooled to room temperature or slightly cooler. Pour 1/2 cup and 1 tablespoon cold cream into a chilled metal bowl; whisk until cream holds soft peaks. Place about half the whipped cream into the cooled chocolate mixture; gently fold the cream into the chocolate. Repeat with remaining half of whipped cream, folding gently until nearly all the streaks have disappeared. Divide mousse into 4 6-ounce ramekins. Cover each ramekin with plastic wrap and refrigerate at least 4 hours (up to overnight) before serving. It's OK to me but my family deffinately didn't like it. I don't think they like spicy chocolate.